What can we learn from Chris Froome’s physiological test data? Not a lot of elite pros release physiological tests, and this means that there’s not a lot of other data to compare Chris Froome’s with. It’s certainly interesting to see numbers for a current Tour de France winner, but that lack of comparison undermines any attempt to prove anything definitive with it. The main criticism Froome faced over the summer was simply that he was too fast to be plausible, especially uphill. Attempts to work out Froome’s power-to-weight ratio were largely calculated from TV coverage (yes, really). There were suggestions of values up to 7 watts/kg – Lance Armstrong territory. The values in the lab data are lower – 5.98w/kg. Froome was heavier at testing than he’d been at the Tour, so the data was extrapolated to a value of 6.25w/kg if he’d been at race weight. Make no mistake about it, this is a very big number. But it’s a lot less than 7w/kg. Is it believable? For a Tour winner, yes. On it’s own it’s certainly not enough to prove Froome’s critics right. The lab numbers also match up reasonably well with the numbers released by Team Sky during the Tour. There they claimed his power-to-weight was 5.78w/kg – which fits tolerably with the Tour numbers having been taken at moderate altitude. What else did we get? A lot of us are familiar with VO2 max as a one-number reference for fitness. It measures the size of a rider’s aerobic ‘engine’ by looking at how many millilitres of oxygen they can use in a minute, relative to their weight. An untrained man of Froome’s age might have a VO2 max of around 40 millilitres/minute/kg. A decent amateur? 60 or so. A WorldTour pro? 80, maybe a little more. The very highest numbers ever for cyclists are around 90, or maybe just over. 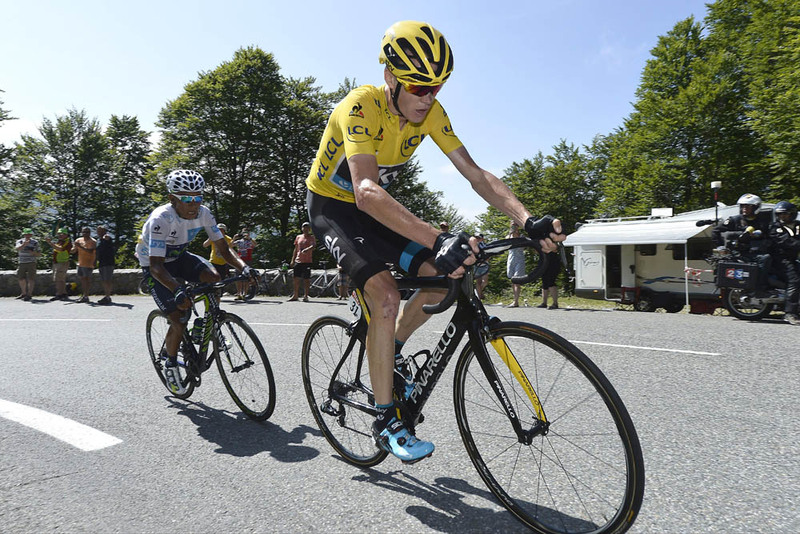 Chris Froome leads Nairo Quintana on the final climb of Stage 10 of the 2015 Tour de France. Froome was 84.6 as tested, extrapolated to 88 at race weight of 67.5kg. Like his power-to-weight: it’s among the highest recorded. But again, for that level of rider, nothing that you could honestly describe as “unbelievable”. The data from 2007 (from a different lab, almost certainly using different protocols, so not 100 per cent comparable) suggests that he was a similar rider back then – but a lot heavier at over 75kg. Allowing for the weight loss, his VO2 max was very similar. His power-to-weight was only 5.56w/kg – but the improvement in this was almost all down to getting lighter. We got some blood results as well, which are within normal parameters. The problem with them is really that they only cover two samples, both taken over the summer. To tell very much we’d need more samples taken over the season to see the changes and trends. For the same reasons, it would be nice to see physiological data taken across a full season. The other thing it would be interesting to see would be some anaerobic tests – that side of his physiology profile is ignored, yet it was very important in the early moments of the mountain attacks that attracted so much attention. There’s no smoking gun here. Yet it’s hard to imagine it will silence the critics – because it doesn’t definitively prove anything either. If you could prove athletes were clean or doping with physiological tests, the World Anti-Doping Agency would have been doing it for years. Some critics in the summer suggested that a power-to-weight ration of over 6w/kg was the dividing line between clean and not clean – in truth this was an arbitrary line, just as any line you draw in physiological data will be. In any event, most scientists would agree 6w/kg is too low to be taken seriously as a red flag. This is really about openness. In the summer, the media demanded field data, and got some. Then the demand was for lab data, now they have some of that too. For a team that came to cycling promising to be different, Sky quickly acquired a reputation for being secretive, especially with the French press. Their popularity suffered as a result, and that’s what they’re trying to deal with now. As a PR offensive it’s unlikely to make Froome’s problems go away. But he’s likely to regard it as a step in the right direction.